Scotland Balls - Gary Ling, Digital Producer, Data Monetiser, Political Savant, Information Economist, Solution Seller, Business Strategist. Posted 16Sept2014: I cut my political teeth in Scotland. At far away (from Watford at least) Aberdeen University our self contained political activity was so off the beaten track that Brian Souter started Stagecoach Limited (now a big financial backer of the 'Yes Campaign') as a cheap transport lifeline connecting us to Edinburgh, Glasgow and Westminster (a 12 quid double decker coach return to London – what a deal!). As an Englishman supporting Mrs Thatcher before the Falklands war, not a day went past when I wasn’t forced to defend my views on free enterprise and her policies to transform Britain. [Did you know that even the Scottish Social Democratic Party (SDP) opposed the privatisation of British Airways?!]. 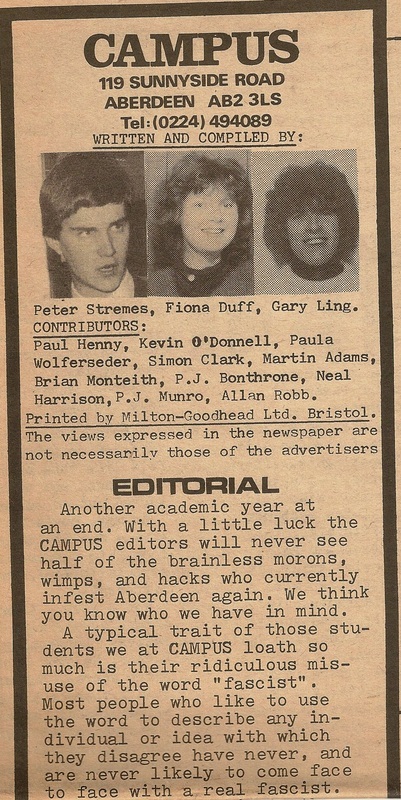 I was active in the Federation of Conservative Students (FCS) and edited and wrote for CAMPUS, an independent student newspaper started by Simon Clark and Peter Young (Radio 5 Live’s Nicky Campbell was an early contributor) and strident Scottish nationalism was something I experienced daily in debate and sometimes physically. For example I was pegged out on the Croquet Lawn at the back of my first year university accommodation in Crombie Hall after England beat Scotland 2-0 at Hampden Park (see “State of a Nation” CAMPUS article, right, from May 1981). I was also banned from the university student's union for 6 weeks after giving a ScotsNat bloke who shoved me a smacking. Today there is no getting away from it. The Scots want Independence. In a German-like PR electoral system intended to thwart majority government, the SNP romped home in the last Scottish parliamentary elections. 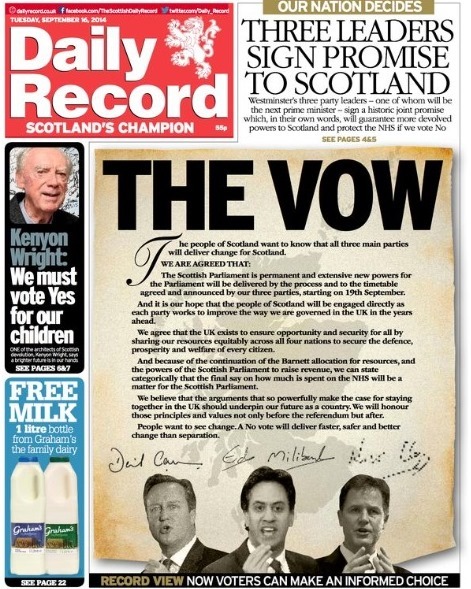 In response, the UK’s three major political leaders have signed 'The Vow'. They have dimly caved in to the demands of money grabbing nationalist politicians north of the border with this ‘Devo-Max’ offer regardless of the outcome of Thursday’s referendum. As a result, instead of supporting a Union with one constantly recalcitrant member, it's time for right minded UK folk to throw their support wholeheartedly behind a 'YES' vote for Scottish independence on Thursday 18 September. People resident in England, Wales and Northern Ireland need to support #YesScotland, otherwise we, in the rest of the United Kingdom, will end up worse off. Outwith the affects on the defence considerations of these Islands, the most significant 'worst' is giving Scotland’s politicians more independent fiscal power whilst still part of the United Kingdom sterling area. The result is the rest of us within the sterling area will backstop the increased spending north of the border as we all assume liability for any sterling debt incurred when we have to bail them out as a last resort. In short, while they will be busy administering their affairs with money borrowed on our UK credit rating transferred by the UK Treasury under the Barnett Allocation (see 'The Vow' right), we will have little say in how that borrowed money is spent. The credibility of the Bank of England such as it is, will be used to make Scotland a ‘more equal, fairer’ society as Scottish politicians ignore objective aspects of economic reality, pander to domestic pressure groups and make structural reforms which will worsen Scotland’s worldwide competitive position both within the UK and internationally. Since the global Gilts market has lost its ‘bond vigilante role’ as a result of central banks’ quantitative easing, The Vow's devo-max Scotland within a UK sterling setting will hasten these Islands route to fiscal bankruptcy. The likely close ‘No’ vote win on Thursday is a terrible outcome for England, Wales and Northern Ireland. It will mean years of ‘drip feed’ misery for taxpayers south of the border as Scottish party political allegiances remain unchanged and the nationalists start their push for yet another independence referendum which will cost the rest of the UK even more as Westminster politicians try once again to keep the Union together. Of course, there will be uncertainties for all parties if Scotland breaks away. But all sides will have strong incentives to negotiate fair solutions as equals. 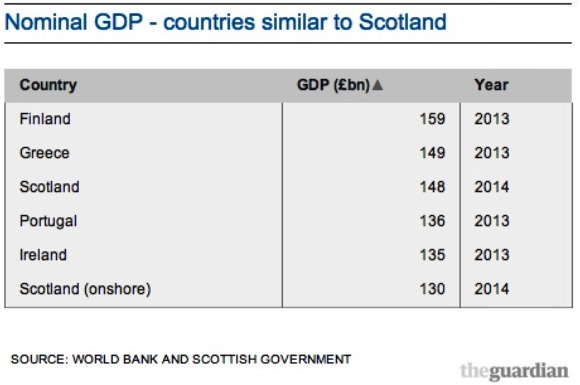 On the most important economic issue for the UK, even if Alex Salmond and a new independent Scottish government renege on their estimated £120 billion worth of current UK Scottish debt (this would be very bad for Scotland), we - the rest of the UK - can still manage. In the last budget, the Chancellor mooted issuing 100 year bonds to finance UK debt. What balls he has! In the current climate investors would still buy UK 20 year paper at a reasonable yield without Scotland. With the ECB about to start massive QE to reflate the Eurozone, UK government debt obligations are likely to be a good bet for the decade to come. For Scotland itself, two key benefits will derive from Independence. One will be that as they increase social security, healthcare and welfare benefit spending, Scotland will attract more overseas immigrants who might just continue on from Calais, pass London and head on up to Glasgow! For all their blathering about racism and fairness, the Scottish population is pretty homogenous. Diversity to someone from Edinburgh is meeting someone from the Shetlands. Many resident Scots have no idea what it's like to live in multicultural Britain. I do, I live in Watford, one of the most densely populated and diverse boroughs in the country - see here. In 1997, I was press officer for the Scottish Conservative Party in Edinburgh in the highly charged world of Scottish politics, when Tony Blair’s Labour landside wiped out the centre-right in Scotland. Other than the Tory Tartan Chicken (see and click right), the thing I most vividly remember about that campaign is that UK pro-enterprise, free market political parties are considered 'too English' to be elected in the land of Adam Smith. Whether it's Mrs T, John Major, David Cameron or Nigel Farage the free market doesn't get a proper look-in on today's Scottish political landscape. Despite its Euro MP win, UKIP north of the border is not the party for the 'disenchanted, left behind' like it is in, say, the east of England. The only way to remedy this democratic deficit is through the emergence of a home grown centre right party in an Independent Scotland. Lastly, the greatest benefit for the rest of the UK from an Independent Scotland is that at last we won't have MPs from north of the border voting on education and health issues which affect people south of the border, when those same politicians currently cannot vote on these matters in Scotland. A secondary benefit is that the UK is likely to be a more free enterprise, dynamic economy as it will lose the 58 whingeing centre left MP contingent from Scotland! The bottom line is: South of the border we are disenfranchised as Scots vote whether to leave the United Kingdom. Instead of pandering to Scottish nationalist sentiment with 'The Vow', like our UK party leaders (? ), ordinary people should call their Scottish chums who can vote and say: "We should let our two independent political and cultural systems go head-to-head. We can still respect and learn from each other but let the best organised, most competitive, freest, least corrupt political system win! It’s time for Scotland to Grow Up. It’s Time to Vote ‘Yes’!" An independent Scotland will turn out to be a Win-Win for all of us! 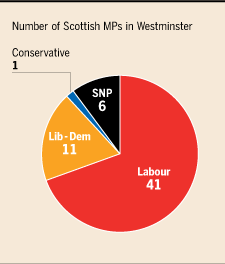 An Independent Scotland won't be sending 58 centre left MPs down to Westminster. It also gives the UK a once in a century opportunity to reorder its politics by cutting back on the number of paid for politicians at all levels by rethinking boroughs, counties, regions and unitary authorities. I guess in a Referendum with a 'Yes/No' question the spoiled papers are statistically insignificant - hence 100%! My take for CAMPUS on Scottish nationalism, croquet style, in May 1981...Click to enlarge and read. The disastrous 'Vow' signed by all main party leaders means Scotland's place in the Union after a 'No' Vote will result in years of resentment and constitutional haggling. If only they called it a 'Pledge' then at least Nick Clegg could have broken it! Just as they missed the 'sentiment' for Independence six months ago, global financial markets under appreciate the fact that Scotland has a great education system and enough national resources to make a fist of going it alone. The rest, like life, is one long negotiation... Be Brave Go For it! Political debate in Scotland has always been highly charged. When we spoke up for free markets at Scottish universities in the 1980s we were often labelled 'fascists'. Today, when Nigel Farage's UKIP talks about the economics of migration, they are called 'racists'. Scotland needs a centre right Enterprise Party - it will only get one when the nationalists are challenged in an Independent Scotland. I was press officer for the Scottish Conservative Party in the 1997 General Election campaign when the centre right was wiped out in Scotland. The Tory Tartan Chicken was a memorable highlight. And how can you survive without an understanding of the Theory of Balls? R Baker 16/9/14: While you touch on defence, you completely miss the foreign policy affects of Scotland breaking away from the UK in this article. Britain's credit rating is significantly influenced by how we are perceived to be a reliable world power. The markets are likely to avoid UK Treasuries in the future without Scotland. Dan Watson 16/9/14: Complete rubbish from beginning to end. I think it's time we all got out the crocquet mallets! Argie Bargy 16/9/14: You hide your true political message until the very end of this diatribe: "the UK is likely to be a more free enterprise, dynamic economy as it will lose the 58 whingeing centre left MP contingent from Scotland!" Since I don't want to live in a UK like this I will be calling my 'chums' north of the border to vote 'Yes'! Michael G 16/9/2014: Had dinner with a Slovakian who is married to a Bulgarian recently. She is deeply regretting partition with the Czech Republic. Scotland will regret it if they leave and our position in the world will slip. As regards England, forget about the Switzerland analogy. Think of Austria after WW1. I am a fervent Unionist but recognise that inherent unfairness in the preferential treatment of the Scots and Welsh (free prescriptions (both) and free uni tuition fees (Scotland)) must end and yet another failure by Cameron, this time to address the West Lothian question, must be remedied.